Talk Lightning hockey with fans and staff at the BP Message Boards and follow us on Twitter! The Tampa Bay Lightning have agreed to terms with defenseman Nikita Nesterov on a three-year, entry-level contract today, vice president and general manager Steve Yzerman announced. Nesterov, 6-foot, 183 pounds, played in 35 games with Chelyabinsk Traktor of the KHL this season, recording 14 penalty minutes while averaging 12:21 in average ice time. He also appeared in 19 playoff games, recording four assists as Traktor lost to Dynamo Moscow in the Continental Cup Finals. Nesterov has played in 45 career KHL games, all with Traktor, recording one assist. A native of Chelyabinsk, Russia, Nesterov has represented his country in each of the previous two seasons. He played for Russia at the 2011 IIHF World Under-18 Championships, recording two goals and four points in seven games. Nesterov then played in last year’s IIHF World Junior Championships, skating in seven games and registering two goals and five points. Nesterov, 20, was selected by Tampa Bay in the fifth round, 158th overall, of the 2011 NHL Entry Draft. He participated in the 2012 Lightning Development Camp at the Brandon Ice Sports Forum. Nesterov’s team, also made up of Vladislav Namestnikov, Slater Koekkoek and Cedric Paquette, took home the annual 3-on-3 tournament championship. Nesterov is an undersized puck mover who plays a strong positional game. He has a high hockey IQ, which helped keep him in the KHL this year. In fact, Nesterov was used at both forward and a defense for Chelyabinsk late in the year and in the playoffs. The NHL's draft lottery was tonight and the hockey gods weren't necessarily kind to the Lightning, but they weren't unkind, either. Colorado won the lottery and will pick first overall, moving up from No. 2. The Lightning remain third in a draft that has three potential No. 1 picks: Portland defenseman Seth Jones, Halifax center Nathan MacKinnon, and Halifax winger Jonathan Drouin. Drouin is the most skilled prospect in the draft, but Jones and MacKinnon both play more premier positions - especially Jones, who is a rare find nowadays. No. 1 defensemen as adept and fluid as he is at both ends of the ice don't come around very often. MacKinnon is a franchise center and with teams building from the net out and down the middle, he's a prized piece to most any roster. After losing Games 6 and 7, Barrie netted a 3-1 win in Game 7 to advance to the OHL Finals. Lightning prospect Jake Dotchin was suspended for the game for a checking-from-behind call in Game 6. Barrie will face London for the right to claim the OHL championship and advance to the Memorial Cup. It all started with the physical play. Coming off a come-from-behind overtime win one night earlier, the Syracuse Crunch made a point to continue pounding the Portland Pirates. It didn't take long -- less than 10 minutes -- for the results to show up on the scoreboard. Ondrej Palat's wrister beat Pirates goalie Chad Johnson, giving the Crunch an early lead. "He's finishing checks and hammering guys, then he goes and scores the first goal for us," said Syracuse coach Rob Zettler of Palat. 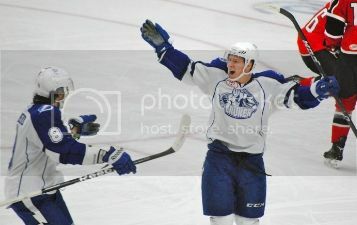 Palat and Tyler Johnson each provided a goal and an assist, leading the Crunch to a 4-2 win over the Pirates in Game 2 of the Eastern Conference Quarterfinals at the Onondaga County War Memorial Sunday. Syracuse leads the best-of-five series 2-0, with the teams meeting again in Portland Thursday.